This video is from an impromptu outdoor show in Philly back in 1982. 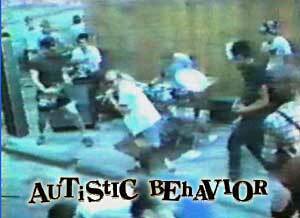 Autistic Development only got through about 5 songs and then the cops busted up the show. Instead of me explaining check out this pdf with two zine articles (Savage Pink & Die Young) talking about it Click Here to see the pdf They had two tracks on the Get Off My Back comp and recorded an album which was never released. To get that go to Noise Addiction. Thanks again to Pete at Drugmusic.com. for the beta tapes and Bret (Noise Addiction) for the info and zines.